At Lakeview Dental, we can provide you with dental implants that look like your original teeth and offer many benefits. 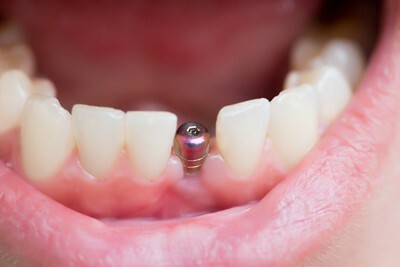 Whether you are looking to stabilize dentures with dental implants, have suffered an injury that requires tooth replacement, or for other cosmetic purposes, our dedicated dental professionals can help. Cosmetic – Dental implants look like real teeth and provide a nearly permanent solution for missing or damaged teeth. Comfort – Dental implants are inserted directly into the bone and integrate with it. This results in an incredibly stable tooth. Lasting performance – Dental implants are manufactured from extremely durable materials and with the proper care, can last a very long time. Confidence – Many patients who choose to have dental implants experience and increase in confidence and self-esteem. Our dental implant procedure consists of placing a Titanium cylinder directly into the jawbone. This cylinder must be left in the jaw for a duration of up to several months or until it has fused with the bone. After the implant has fused to the jawbone, a metal post is inserted into the cylinder, and a crown is cemented to the top of the post. Once the procedure is complete, you can enjoy having full functionality to the tooth. For more information and a consultation with Dr. Adelakun, please contact us today to find out if dental implants are right for you.